So. The first quarter of 2016 has already come and gone: where is the time going, kittens?! It seems like just yesterday it was Christmas, and here we are: 01 April. 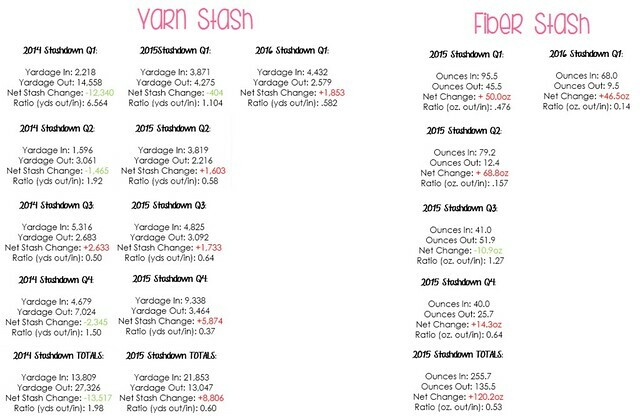 First Quarter can not be said to be very successful at first glance; I’m red in both the fiber and yarn categories. The numbers are promising, though! I noticed with my fiber increase, despite the fact I’m in the red, I brought in almost 30 fewer ounces of fiber than the same time last year (This is ~7 braids of fiber, as a frame of reference). I also spun less, but this shows a decrease in buying–which is what this exercise is really about. I will take any positives I can find here! Most of my fiber purchases were large ones, which meant less buying overall and plans for bigger projects. I’d call that good, wouldn’t you? I also had an increase in my yarn stash of just over 1800 yards. That might not sound like a win at first, but when you take into account that one of my purchases was an 1800yd sweater quantity, it gives some reference to how well I did in knitting up at least what I was bringing in. Had I forgone the SQ, my stash increase would have been a paltry 53 yards. I was very close to stash neutral with this level of buying and knitting I’ve been doing. This is *huge* without destashing involved, so I’m rather chuffed about it. I’m really hopeful that Q2 is going to be an overwhelming success across the board! How can it not be if I keep things going at this pace?